The bizarre shape of this cigar immediately catches the eye. If you can figure out how to smoke this cigar from another dimension, you will be pleasantly surprised. 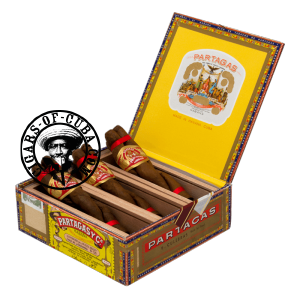 It is quite mild for a Partagas in the initial phase but will increase in power throughout the smoke. These cigars can sometimes suffer from draw problems due to the unique shape, but every humidor should have a couple of these in them. The bizarre shape of this cigar immediately catches the eye. This version is handmade and come in three coffins of three intertwined cigars. It is quite mild for a Partagas in the initial phase but will increase in power throughout the smoke. Every humidor should have a couple of these in them.